Categories: audio, dclsg, Documentary, Event, Facebook, Narration, translation | Tags: Dong Heng, KBS 1, Lee Seung Gi, translation | Permalink. Mi Yeon and Seung Gi discuss how much pocket money they have left for the group… Mi Yeon says that wine is expensive so they should ban coffee and wine for Hee Ae and YYJ! Uh oh…. They meet up with Hee Ae and bring her a cup. SG asks the producer to borrow 3 Lira to buy pomegranate juice for YYJ…she says delicious! Turkish Airens wave at SG. Mi Yeon takes the orange bag from SG and he says he’s touched. Seunglish…”I’d like a reservation…over and over again…no one seems to understand.” Answer to him is “No reservation” Captions say “he’s like a talking parrot.” LOL. Mi Yeon is really amused as the ice cream man is playing magic tricks and flirting with her. YJ has chocolate, berry, and vanilla flavored ice cream on a cone, same with Miyeon. They are checking out of the hotel now…loading luggage into the van and taking off. They arrive at the baggage carousel and SG is running around like a chicken with his head cut off.. Hee Ae and Mi Yeon take some of their baggage but SG does the rest. SG goes to find the times of the last shuttle…. Mi Yeon is called by SG …SG asks “Excuse me, where is the closest information? They have to buy tickets for the last airport bus which leaves at 8pm..he asks the driver “May I buy tickets?” “10 minutes, OK thank you very much” He tells the nunas..
Seunglish “Can I buy ticket? Can I buy tram ticket? YYJ: We can take a us here to go to Jelaicaic? Not tram? Ja OK is relaxing sitting and eating squid or some snack. SG asks a man in an airport store for directions – remember the photo of him in a fuzzy ivory fleece top holding up a travel guide? It said in my translation, “We’re pressed for time”? Seunglish “Excuse me, where can I get the tram?” YYJ claps and says,”that’s correct”. Hee Ae and Mi Yeon hug each other and share a sisterly moment at the tram station. Each have a private interview and reveal the real person they’ve gotten to know compared to the outside image. Meanwhile, Hee Ae nuna says that there was a really pretty girl that was outstandingly pretty when asked where SG went. The 2 women tell him to take tram #6, get off after 2 stops…Mi Yeon and all the nunas get on the tram again…wrong directions…Ja Ok’s private interview~ it was difficult, but it was fun, one or two stations…what’s the difference? YJ comments how diligently SG was studying on the plane as they show SG’s notebook…written in Korean and English. They’ve been walking for 20 minutes! YYJ says “what are we going to do???!! !.”A bathroom is really important to me, we have to establish an order here for the 4 of us to use.” She asks the producer where her place is and she says it’s far from their place. Ja Ok and YJ talk about whether they washed their hair. YJ says she did today. They are eating Ramen noodles and Korean side dishes. They are busy talking about amusing things at the table..
Now they are unpacking and getting ready for bed.. They possibly got kicked out of the hotel because of the Korean food smell? Kimchee Jigae? Previews for the next episode. Categories: Narration, translation, Variety show | Tags: Episode 3, Nunas Over Flowers | Permalink. Categories: Na PD, Narration, Photos, Variety show | Tags: Insects of Greatness, MBC, Nunas Over Flowers, tvN | Permalink. It’s going to be tough for Airens to choose between Seung Gi and Seung Gi this Friday night. MBC vs. tvN. Insects vs. Nunas over Flowers. I think we all know which show is going to be on everyone’s must watch list. Both are scheduled for 10pm and the competition for viewers is getting stiff. I’ve been seeing ads for MBC’s documentary on TV several times a day lately. However, Na PD and tvN have done a great job with their teasers to draw netizen’s curiosity about the upcoming variety show. The most recent Broadcast Preview released today was the funniest of the 3 I’ve seen so far. Here’s Seung Gi’s soothing voice on MBC’s documentary. Translations to come… I’ll have to watch it as a rerun. I’ll definitely be watching tvN’s Nunas over Flowers this Friday night. Categories: Narration, Video | Tags: documentary, insects, Lee Seung Gi, MBC | Permalink. [TV Daily Reporter Kwak Hyun Soo ] Singer and actor Lee Seung Gi will be narrating the MBC documentary. Lee Seung Gi recently finished recording the narration for ‘Insects, their Great Instinct’ to mark MBC’s 52nd year anniversary feature documentary. ‘Insects, their Great Instinct’ is a production describing insects’ ecosystems that people don’t even think about. It is also the product of mutual understanding with the production crew whose documentaries such as ‘Amazon’s Tears’ and ‘The South’s Tears’ are filled with joy, anger, sorrow, and happiness. 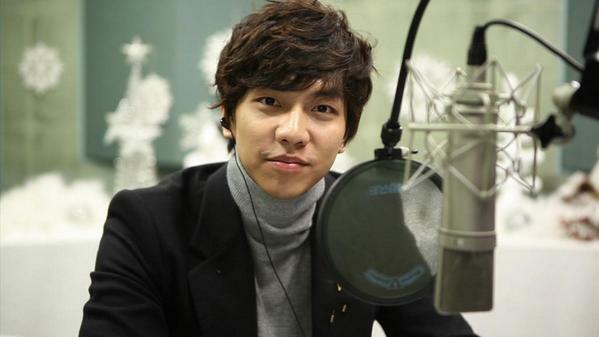 On the 20th, for the sake of recording his narration, Lee Seung Gi came to MBC. In order to understand the documentary, he met with Kim Jin Man PD and had a discussion. Afterwards, Kim PD said “I received a deep impression as if I had an interview with Cho Young Pil.” He also revealed his trust in Lee Seung Gi. In addition, Lee Seung Gi also replied,”I had fun watching Kim Jin Man PD nim’s documentary” while creating a friendly atmosphere. Lee Seung Gi’s voice which accompanies ‘Insects, their Great Instinct’ will be broadcast on the 29th, at 10pmKST. Categories: article, Narration, translation | Tags: insects, Lee Seung Gi, MBC, narration | Permalink. ‘Insects, Their Great Instinct’ (planning by Hong Sang Woon, directing by Kim Jin Man, Kim Jung Min) in the meantime has sparked interest in the little known ecology of insects which is becoming a hot topic of conversation. They have also produced the documentaries that people can empathize with called ‘Amazon’s Tears’ and ‘The South’s Tears’ which have been MBC’s selected documentaries through a mutual understanding with the production crew. Every year, MBC’s featured documentary has been narrated by Kim Nam Gil, Song Joong Ki, and Hyun Bin among other top male stars who have participated and gathered a great deal of attention. This year’s ‘Insects, Their Great Instinct’ was undoubtedly in the public eye regarding who would do the narration with the broadcast coming up soon. Therefore, the production crew sent a request to ‘the Nation’s Hoonnam’ * and ‘the Nation’s Porter’, Lee Seung Gi, who would be best at raising interest. Usually, he who enjoys documentaries willngly joined efforts with the production team of ‘Amazon’s Tears’ in a positive reply to their love call for ‘Insects, Their Great Instinct’ according to rumors. As a singer and also actor who has been as active as he has, Lee Seung’s gentle voice and accuracy of his delivery will serve as a backdrop to a new type of charm. Netizens who have heard of this work have said “I am looking forward to Lee Seung Gi’s narration” ” Lee Seung Gi’s narration of ‘Amazon’s Tears’ what do you mean it’s the production team’s national pride” “Lee Seung Gi will do a good job narrating” “I really want to hear Lee Seung Gi’s narrations as soon as possible, I have to watch the broadcast” were some of the responses. *Hoonnam in Korean refers to a kind, gentle, and sincere male who is also gentlemanly and good looking. Categories: article, Narration, translation | Tags: documentary, insects, narration | Permalink.